The suspension is part of steps being taken by the government to ensure law and order and to guard the sanctity of rule of law in the country. 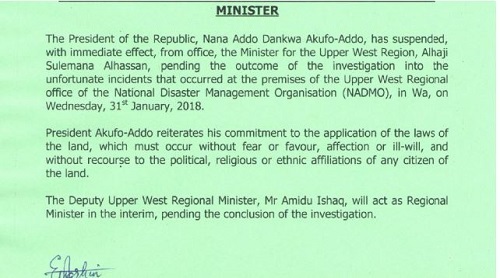 The Deputy Regional Minister Amidu Ishaq has been asked to act in the stead of Sulemana pending the conclusion of the investigation, the statement added. The suspension follows several acts of violence committed in the name of politics by followers of the governing party. Angry New Patriotic Party youth have over the last 11 months held the country hostage with numerous attacks on individuals, institutions and even on party members. They have taken over the running of public toilets, public transport stations, NADMO, NYA and other public offices.